Investors will learn more Wednesday about why Federal Reserve officials did an apparent U-turn in policy three weeks ago when they signaled a much easier stance regarding interest rates. Jerome Powell said afterward that it would take a shift in data to convince him that more moves would be needed. Market participants will be digging closely through the meeting summary for clues on how the Fed views its interest rate framework, the assessment on the economy, and the plans it has for the $3.8 trillion in bonds it is holding on its balance sheet. While a minutes release might seem an otherwise mundane dig through monetary policy, the Powell Fed has put a special emphasis on communication. The chairman now will hold news conferences after each meeting to explain Fed actions to the public, and he has kept up a busy schedule meeting with lawmakers on Capitol Hill. Fed officials have been pretty clear lately about their intentions on interest rates. 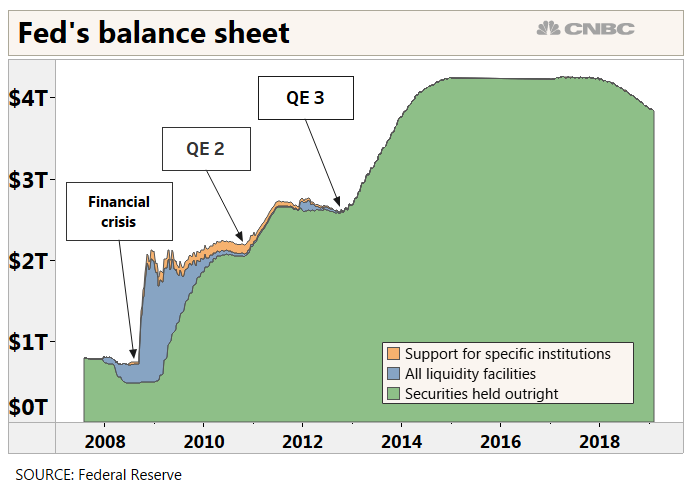 Less certain is what the central bank will do with the balance sheet. The Fed currently allows up to $50 billion a month in proceeds from Treasurys and mortgage-backed securities to roll off, though it does not regularly hit that number. Anything beyond that would be reinvested. Since the process began, the bond portfolio has shrunk by more than $400 billion. The balance sheet had once stood at $4.5 trillion, the product of three rounds of bond buying — quantitative easing — the Fed instituted to lower long-term rates and pull the economy out of the financial crisis. Market participants are now wondering how much further the Fed will go. The minutes will be looked at closely, particularly considering that the stock market rallied after the meeting and the perception that the Fed would take a less aggressive approach to tightening. Indeed, the market sees no additional rate hikes ahead as the Fed’s benchmark rate sits in a range between 2.25 percent and 2.5 percent. Traders actually are assigning a small chance — about 10 percent — of a rate cut by December. Markets have recovered mostly from those issues, but Fed officials have been discussing how to improve communication, particularly if another crisis hits. English said officials have some other options available to them to give the public a more reliable road map for future intentions. Among them are a “fan chart” for the possible direction of the fed funds rate, and information about the way policy could respond to changing economic conditions. The fan chart would be similar to one the committee uses to display the level of uncertainty around interest rate projections. The intent is to keep investors aware of how much difference there is in various forecasts and reinforce that the rate estimates are not carved in stone.